Ben Hunt says a top-four spot in the finals is still achievable for the Dragons. 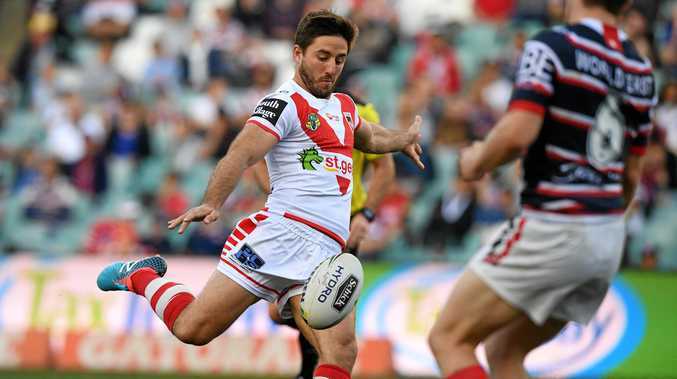 IT'S been the off-limits "c-word" that hasn't been mentioned all year, but St George Illawarra halfback Ben Hunt admits he can see why talk of the Dragons' "choke" is back and potentially playing on some teammates' minds. Early season ladder-leaders, the Dragons are out of the top four for the first time this year having dropped five of their past six. Ahead of their crucial clash with Wests Tigers on Sunday, the Dragons are open and frank in acknowledging their form has to turn around fast if they want to strike come finals. "Obviously we have lost a few games at the moment - we played well at the start of the year and have lost a few now," Hunt said. "That's usually what you call teams like that: they are the chokers. "We're still in a really good position, we're still in the finals, we're still going for the top four. It's up to us to do that now." From the start of the pre-season, all the external talk at the Dragons has been about why this year is different. Why the late-season collapses that ended coach Paul McGregor's 2015 and 2017 campaigns won't repeat. But with the recent form slump those questions have become an avalanche. And Hunt admitted that at some point it could impact on players. "I can't talk for everyone because I wasn't here last year, but I'm sure it might play on some boys' minds," he said. "It's happened a few years in a row now. Everyone starts talking about it on the outside and sometimes you just can't get away from that. "Whether it's playing on some boys' minds or not I'm not too sure. But it's not playing on mine." NSW forward Tyson Frizell insists he's not one of those players and is confident this isn't a case of past horrors repeating. But what's undeniable is that the slump has crushed the Dragons over past the six weeks as they've averaged seven less points per game and conceded almost an extra 14. The metreage is also down, after outrunning their opponents in all but two matches over the first 16 rounds - they haven't done so since. According to Fox Sports Stats they Dragons also forced just three dropouts in that time and missed an extra five tackles per game. "I might be naive but it's hard to swallow that and say we're going back to our old ways, because we know we've been a top-four team for all year bar this week," Frizell said. "I can say we are a different team because for the past few years we haven't been sitting in the top four all year then dropped out. "It's only the past couple of weeks that haven't been up to the footy we want to play."